Festool 204344 R54G Carbide Tipped Blades 2-1/8 in. 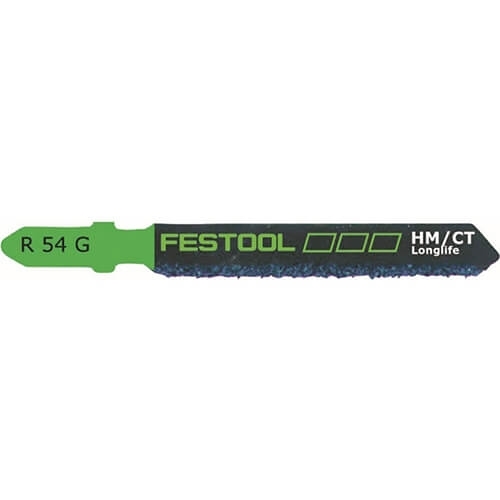 Festool 204344 R54G Carbide Tipped Jigsaw Blades 2-1/8 in. (1) Festool 204344 R54G Carbide Tipped Jigsaw Blades 2-1/8 in. The R 54 G jigsaw blade is a blade is a special blade for cutting glass, wall tile, ceramics, fiber-reinforced plastics, cement board, iron, and steel. This blade doesn't have teeth, but hard soldered carbide tipped splitters that cut through all tough materials you can think of. Thanks to its design, this is the ideal blade for fine cuts in these though materials. Festool jigsaw blades are engineered for cutting efficiency, long life, and superior cutting results, with a universal T-shank design that fits most professional jigsaws. Festool has the right blade for any application or type of material, ensuring precise and consistent results. In order to select the right jigsaw blade for your application, think first about the type of material you want to cut, since there are blades available for wood, plastics, non-ferrous metals, steel, and special materials like fiberglass, foam, and other materials. Next decide what kind of cut you need: fine, fast, scroll, clean. This will help to decide which blade is right for you. All Festool jigsaw blades are made in Germany from high-quality materials for the best possible cutting results. Includes 1 jigsaw blade.